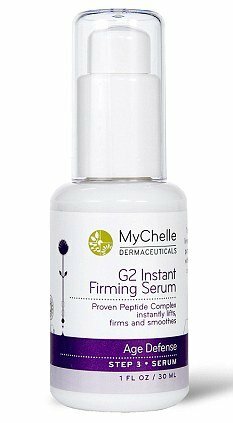 MyChelle G2 Instant Firming Serum is said to make women look younger just an hour after application. U.S-based company Mychelle, who specialize in natural products, say their latest miracle serum is formulated to lift the face and boost collagen fibres for a wrinkle-free look. Their vegan-friendly, gluten-free G2 Instant Firming Serum contains a peptide complex to lift and smooth lines and wrinkles. It also uses natural ingredients including goji berries and pomegranate extracts for their anti-oxidant properties that fight free radical damage. MyChelle G2 Instant Firming Serum has already caused a buzz in the U.S. prompting 8,000 people to sign a waiting list for the product prior to its UK launch this month. Beauty blogger Victoria Girard from revealgreatskin.com described the texture of the serum as “fantastic”. Meanwhile, Meredith Ball, BellaOnline Natural Living editor, said the product “did live up to its claim to firm up my skin and decrease wrinkles”. “Within two weeks I already saw the skin on my face appearing tighter and the wrinkles around my mouth diminishing. After using it once a day for one month I still have 3/4 of the bottle left, so although pricey, it is worth the expense if you can get it on sale,” she added. The MyChelle G2 Instant Firming Serum costs £52.50 ($80) for 30 ml and is available from Harrods, Whole Foods Market stores and at www.mychelleuk.com.